Most Europeans know exactly what they are and how much fun Kinder chocolates can be, but for those of you who have never experienced the joys of these children's sweets (candy) here is a brief history and description. The Kinder chocolate range first appeared in 1974 when Ferrero, and Italian confectionary company, decided to expand from the adult market into children's sweets with a series of brands (Kinder Chocolate, Kinder Surprise Eggs, Kinder Brioss, Kinder Freude, Kinder Cereal, Kinder Colazione, Kinder Delice, Kinder Bueno, Kinder Fetta al Latte, Kinder Pingui and Kinder Paradiso). To attract the attention of Europe's youth the Surprise Eggs - originally known as Kinder Sorpresa - and Freude ( a larger version of the Surprise Eggs) contained toys. Kinder Surprise Eggs are a creamy chocolate egg (about 3" / 7cm high) that contain a small plastic capsule. The egg itself is a thin shell of two layers of chocolate (32% dairy products according to the wrapper); dark on the outside and white on the inside. For most people it doesn't have a very rich taste, but connoisseurs believe the flavour to be quite exquisite. The plastic capsule (measuring 1-3/4" / 4cm tall) inside the shell varies in colour, but is mostly yellow, orange or green. The toys held within the capsule vary from small models that appeal to both boys and girls, characters (such as Asterix & Obelix, Smurfs, Warner Brothers etc...) that must be assembled, to licensed hand-painted, moulded characters and cartoon animal sculptures. 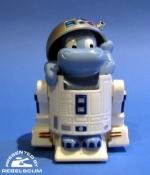 In the past these licensed characters have included Disney, Snoopy, The Flintstones and The Simpsons. Kinder's own cartoon animals have covered sharks, bats, crocodiles, hippos and countless other species. At different times of the year, particularly at Christmas, Easter, Halloween, Valentines and Mother's Day special sets of figures are released. 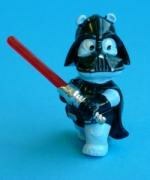 Recently Kinder Eggs have been involved in producing toys for film licenses, such as Lord of the Rings and now Star Wars. In Germany they are known as Kinder Überraschung Eiers, as Kinder Sorpresa in Italy, Spain and all the Spanish speaking countries of South America, in Portugal and Brazil they are called Kinder Surpresa and in Sweden and Norway they say Kinderoverraskelse. Kinder Surprise is the English translation and is used in just about every other country in the world. Kinder Eggs are largely available everywhere - except the USA. This is due to laws separating small parts from children, and regulations of food and non-food items being mixed. However there are plenty of dealers and websites that cater for the demand. Over 4000 different toys have been made - of which over 1200 are hand-painted figures - exclusively for Kinder Surprise Eggs. If you find yourself becoming increasingly interested then a stop at Kinder Surprise - The Unofficial Website is in order. Complete listings of Kinder Surprise toys are hard to find, but they can point you in the right direction. The best place to start hunting for your Star Wars set is through one of our sponsors - at the time of writing Toy Palace has sets in stock. You can also use eBay France and eBay Germany where they are commonly up for auction; one source that can be recommended is shimodasmagic. 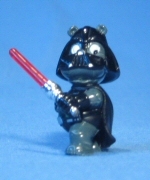 Searching for "Kinder Star Wars" will produce a suitable list of auctions. 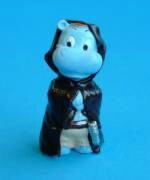 Kinder launched their Happy Hippo Star Wars series in Germany first, during the summer of 2002, with posters (23 x 33" / 59.4 × 84.1 cm), flyers (8 x 11" / 21× 29.7 cm) and display stands in confectioners and supermarkets, and an official Imperium webpage. There have also been a number of TV spots, reports of which have come in from Austria, Spain and Switzerland (as well as Germany) so it seems that Kinder has released the toys in other European countries. The only official display diorama was the large (80cm long) Millennium Falcon diorama shown above. This model was given out to large and prestigious shops in Germany to be used as in-store displays for the new Kinder toys. Very few have shown up commercially through retailers or auctions, but when do they have reached triple figure values. Other smaller displays were released in Germany - see Unlicensed Toys for more. 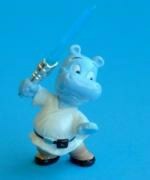 The Happy Hippos went to see the new Star Wars film and are ecstatic. Now they obviously want to experience the newest adventures on their island like the heroes in the cinema. They jump into their costumes and the Hipperium is ready: with his laser sword Luke Eggwalker is putting Dark Laser in his place…great! 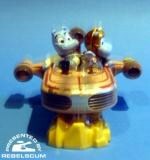 His little robot Erzwo Hippo is beeping so excitedly that he really gets on the golden droid HI-PO's nerves. In the meantime cunning smuggler pilot Happy Han tries to conquer Princess Hippeias heart. His furry friend Aubacca roars so loud that Jango Jet accidentally sets off his jet drive. What a bonus that the masters Hippoda and Obi-Wan always stay relaxed and stand by their Hippo knights, even if things are not always working out like in the cinema. May the force be with them. 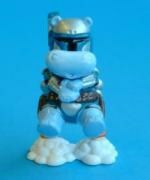 Character Biography: The legendary Hippo knight is Luke Eggwalker's most important advisor and major role model. Obi-Wan has always been passionate about improving the galaxy. 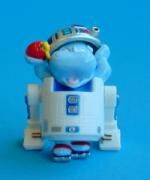 Character Biography: Luke Eggwalkers droid is competent in almost all the languages of the universe. But if situations are getting dicey, he wobbles behind his colleague Erzwo. It is really not surprising that after all this excitement he has to oil his joints here and there. Character Biography: The shaggy Wookie is the co-pilot and companion of Happy Han. He also stands by his side in dangerous situations. And he can roar like nobody else. Buuuarrrhhh! 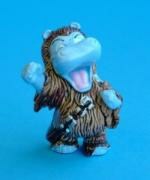 Character Biography: The cunning pilot of the star ship Hipperium Falcon is Luke Eggwalkers greatest friend. On top of that he is irresistible and wants to show Princess Hippeia that he is a hero. Character Biography: He is not a nice contemporary and also possesses a high tech trick. Although he hasn't got any control over his jet pack, even Obi-Wan Hippobi cannot prevent him from populating the cinema screens with clones. Character Biography: The beautiful princess is Luke Eggwalker's twin sister. She has a lot of power and is not even intimidated by Dark Laser. Only Happy Han's charm can soften her. 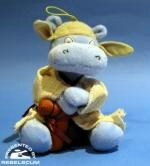 Character Biography: Luke is the young hero of the Hippo Knights. 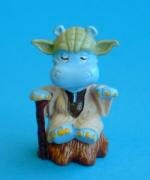 Master Hippoda taught him to trust his spiritual powers. That way he will be fit for a fight with Dark Laser. Character Biography: You can always trust on Luke Eggwalker's loyal companion. Here and there though he has to take a little nap, so that the fuses under his hat don’t blow. Luckily H-IPO is making sure that his little friend doesn’t get too over excited. 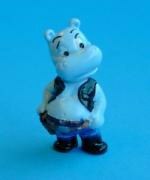 Character Biography: The Dark Lord used to be one of the good Hippo Knights, but now he would do anything to have power over the whole Hipperium.With his dark mask he really does look terrifying. Character Biography: In order to look really frightening the Dark Lord uses a camouflage of black shoe polish under his robe sometimes. No wonder that the vain Happy Han gets annoyed, because once again there will be nothing left over for him to polish his boots. 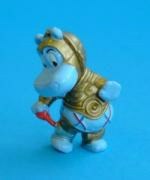 Character Biography: The wise Hippoda shows Hippo Knights how to have faith in themselves and to listen to the Force. Would you have thought that the little chappy with the green ears is capable of that? Typically, Kinder Eggs are sold individually (all of Europe) or in triple packs (excluding Germany). 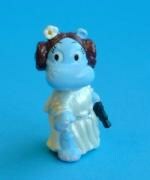 Character toys are normally packed one in every three Kinder Surprise Eggs, but the Star Wars figurines were short-packed - one in seven eggs contained a Hipperium figurine. Because of the reduced chance of finding a character toy it is necessary to buy extra Kinder Eggs. If you were to get lucky and find a different Star Wars toy in every seventh egg you would have to buy 77 eggs to complete the set. It isn't known how many black edition Dark Laser figurines were produced so he doesn't even figure into the calculation. Sadly this doesn't happen very often, so Kinder toys are at least seven times their retail price on the secondary market. Each series is short lived - once a new range has been brought out the previous toys are discontinued/retired. In October 2002 Kinder replaced their Star Wars toys with Lord of the Rings: The Two Towers figurines, thus closing the door on the Hipperium's brief life. Kinder's larger range of chocolate eggs - Freude (meaning "joy" in English) - are more similar to Easter eggs than their small cousins. These large eggs (5.5" / 15cm) are generally available in Europe throughout the year, though some countries (like Britain) only see them at Easter. In November 2002 the Hipperium line crossed over from Surprise Eggs to Freude to meet the DVD release of Attack of the Clones. A series of larger toys, games and puzzles were introduced with these chocolate eggs. At a ratio of one to three they are more common than the Kinder Surprise Eggs, but with fewer stockists eBay seller like shimodasmagic are a good source. Kinder collecting is very popular in Europe, and much like Star Wars, a sub-industry has sprung up around it providing wall-mounted display stands, storage cases and display dioramas. Dragon Designs is the main producer of these and has printed limited numbers (five to ten thousand) of a pop-up Millennium Falcon (called "Blue Star 2002") and an open-faced Darth Vader helmet. 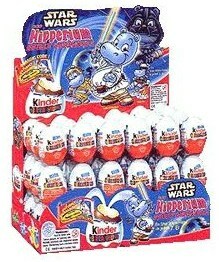 Neither of these are official Kinder products because Dragon Designs does not have a license from Lucasfilm Ltd. These dioramas aren't generally available outside of Germany so you will have to go to specialist retailers like Toy Palace. And because they are printed in short runs there can be a lot of competition over them, so you might end up spending more than you'd expect. As with all auctions, keep your eyes out for Buy It Now deals – they will save you a lot of time and money. With special thanks to Martin Flammer of Martin's Curiosity Shop for helping me find the black edition Dark Laser, Julia Meitz for her skills in German, Axel Ruhle who helped me get the Freude toys, Stephane Houvion who started this all off, Andy Dukes because he dug deeper into eBay than is safe to go and Toy Palace for being the only seller of the Darth Vader-like diorama I could find.